As to the widescreen LCD, I had to stop and think a second, as I remembered thinking that same thing when I first got mine a couple of years ago. I can't imagine not having it now. I'm sure I got used to it pretty quickly. Do you have a fun length mirror? Make sure it's clean and take a picture of the reflection of your feet, I think that is how some people take their pics of feet. 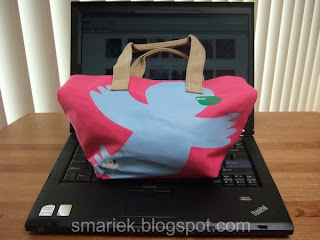 You and little M are not the only ones with the bag thing! I love the socks! They are awesome. And I love the shoes too, they are hecka cute. I'm constantly buying bags for knitting projects. I got the CUTEST bag at Target that was a kid's gardening bag. So. Flipping. Cute. Plus it was like $4. Win. Nice socks. You are turning into a machine, LOL. I do like variegated yarn, but I still love solid colors, especially with all the fancy lace patterns out there. And Judy's Magic Cast on is superb!! Thanks for making the link available. I love those striped socks! 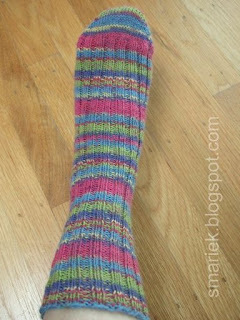 You are so good to keep trying all these different things to make the socks work to your liking. I am so impressed with the care you are giving when knitting your socks. I tend to fly by the seat of my pants. I agree with your sentiments about Judy's Magic Cast On; however, I've used it with one long needle (Magic Loop) and two ciculars (different lengths). It's never been a problem. You are doing so well with your sock knitting. 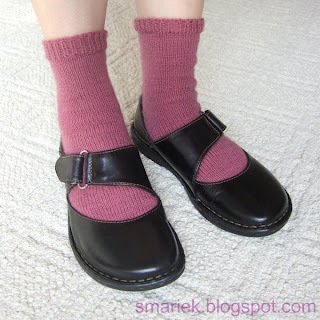 The photos of your socks turned out quite well and what a great idea - shoes for modeling socks. 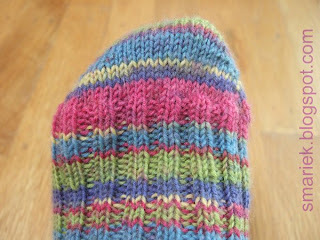 The toes on the stripe socks look great - nice and rounded. The ribbed socks are a much more forgiving in their fit. 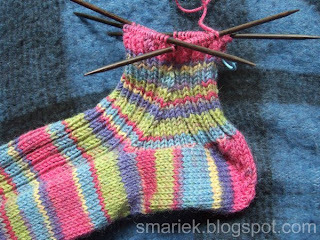 You are going to love knitting the lace and cable socks. 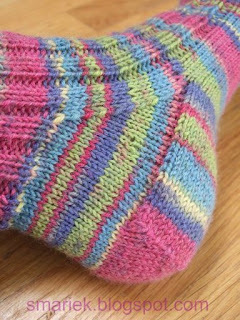 Knitty has some great free sock patterns, check out the Sweet Pea sock, it's easy and looks great on. I like the socks with the stockinette, but the real question is: does one fit better than the other? That's how I would base my decision. I love k2p2 on socks; they fit well. I also add a little twist every 5 rows or so on the k2; that makes it a little dressier and also way easy to count the rounds. I usually: k2 tog and leave on needle, k 1st st and then slip both k sts off. Laptop screen: took about a week to get used to the different aspect ratio; then no problem! PS: I've done Judy's Magic Cast On with dpns, and it all worked out! I LOVE your socks and all the pics!!!!!! My sock yarn just arrived, so I need to try to make some real socks with that. I'm going to try a toe-up pattern, too, because you've just made so much sense to me. 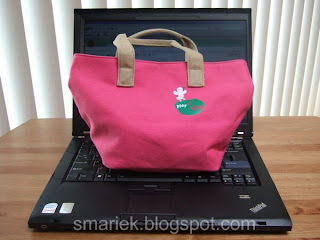 That bag is SO FUN. Love your sox! 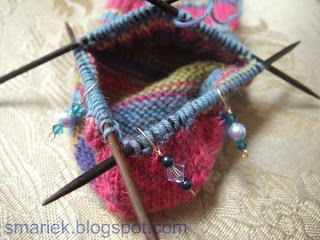 I'm finishing my pair of 2 toe ups( magic loop) right now by working the afterthought heels. Mine are in 2:2 rib and striped nicely. 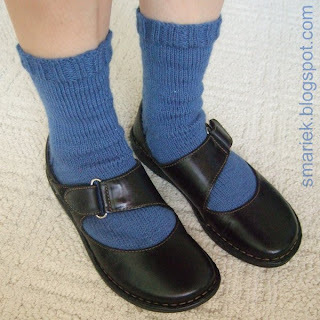 Love your modern "mary janes"! Oh I love all the socks you have made. Those shoes are so cute I have to get a pair. Ooooh, I love those shoes! They're perfect for showing off socks, and I just adore borns because they're so comfortable. You've got to get some capris and show them off! Great post, love your pictures.